Mix classic sparkle & modern design with this stunning bracelet from Mikey. 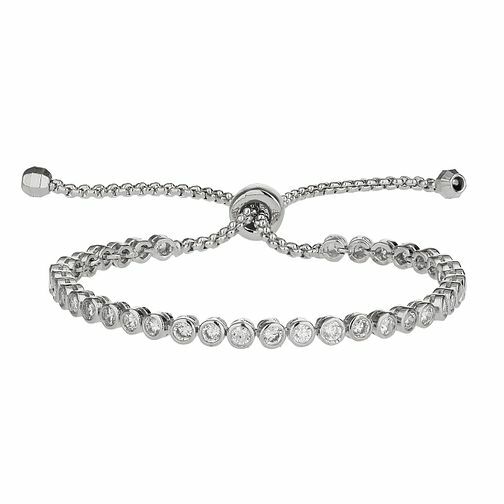 This self-locking bracelet features shimmering round cubic zirconias sitting in sleek, round silver tone settings leading to a simple knotted rope style chain. London based jewellery designer Mikey specialises in unique, wearable glamour for all occasions. Mikey Silver Tone Cubic Zirconia Self Locking Bracelet is rated 4.3 out of 5 by 3. Rated 5 out of 5 by Anonymous from Fab treat for myself Sparkly and stunning bracelet, very pleased with this purchase. Rated 4 out of 5 by Anonymous from Lovely bracelet and perfect for small wrists I love this bracelet as I struggle to get ones that fit nicely on my slim wrists. This works perfectly as it can be adjusted to any size. It looks beautiful and very delicate. Unfortunately one of the end beads fell off my bracelet not longer after getting it. Maybe shouldn't be worn every day.